Covering GDPR and Cyber Essentials in one! Fordway's Security & GDPR Analysis Workshop is a one day workshop run by Fordway to help you ascertain the steps your organisation needs to take in order to achieve compliance. Under GDPR rules you must be able to prove that your organisation is taking the necessary steps to ensure that your business and data are protected against loss, theft and unauthorised access. GDPR aligns closely with and is complementary to, the government backed Cyber Essentials scheme. Cyber Essentials Certification covers infrastructure controls as well as data controls and can be used as evidence to show that your organisation is taking basic steps to meet GDPR requirements. From here we can help your organisation meet its GDPR obligations and enable you to achieve Cyber Essentials certification - helping you solve two problems at once! 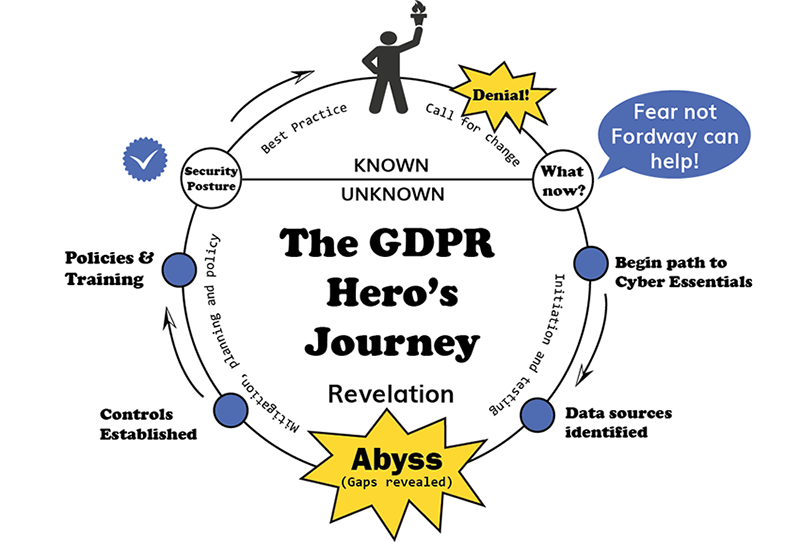 Begin your GDPR hero's Journey today! Send me more information please!